Free shipping now requires a $35 minimum purchase. A lot of changes are happening in the retail world as both online and brick-and-mortar stores try to fight for your hard-earned money. Amazon just lowered their free shipping minimum (the second time this year) to $25, most likely in response to Walmart's newly-launched Pick-up Discount. 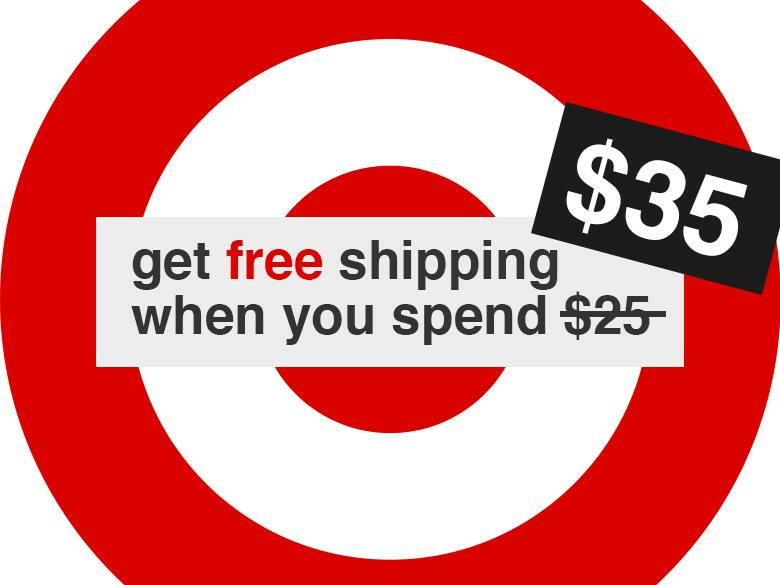 While these two industry leaders are dangling perks for shoppers, Target is going the other way by increasing their free shipping minimum from $25 to $35. This higher minimum purchase requirement went into effect on Sunday, May 7, 2017, exactly a week before Mother's Day (Thanks, Target! </sarcasm>). Ordering online and picking up in stores is still free, so this may be Target's way of "bullying" you into their physical stores so you're more likely to browse around and possibly make impulse buys. For the time being, REDCard holders have free shipping with no minimum purchase requirement, but the fine print on Target's shipping hub does mention that "handling fees or minimum purchase threshold may apply" to REDcard members. It looks like Target is already following through as a Slickdeals user discovered that after May 7th, "Target.com now has a $25 minimum for free shipping for most food items REGARDLESS if you have a REDCard." With such a big push from Target to increase its in-store foot traffic, it seems odd that the retail giant would simultaneously plan testing for a program in the Minneapolis area called Target Restock, which is a next-day essentials delivery service (a la Google Express). Target Restock claims to "save busy guests time, and make it easier than ever to get household essentials delivered quickly." Once this pilot program goes live in the summer, Minneapolis area REDcard members will be able to visit a dedicated online hub where they "fill a box" with available products and have it shipped for a "low, flat fee." These boxes will be prepared at local Target stores, allowing orders placed by 1:30 pm to be delivered by the next business day. It's not known what shipping carrier Target Restock plans to use or how they will define a "business day." Isn't Target open every day of the week? Are any of these changes going to affect how or where you shop? Let us know in the comments below!